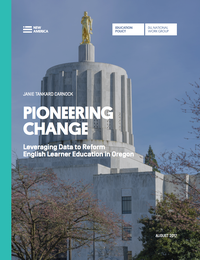 In June 2015, Oregon Governor Kate Brown signed House Bill 3499 for English learner (EL) students into law, describing it as a “watershed moment” in the state’s educational system. The law broke new ground for how to use data to identify and support the lowest-performing districts for ELs across the state. Critically, it came with a dedicated, permanent funding stream: $12.5 million every two years. The reform was a major milestone for ELs. It prioritized a population historically marginalized within PreK–12 policy discussions. In the years since its passage, the law has triggered an important sequence of actions. From July 2015 to December 2016, the law required an advisory group of diverse stakeholders—educators, parents, researchers, and advocates—to convene and define data metrics and criteria to evaluate districts’ success with ELs. In January 2017, the state publicly identified low-performing districts and began working with district leaders to reform EL programming, supported by new state funding, coaching, professional development, and needs assessments. In June, the state passed legislation to codify an EL advisory group for the long haul. Oregon’s still-evolving example is an important one in light of the new federal education law, the Every Student Succeeds Act (ESSA). Under ESSA, states will have considerable autonomy to make decisions about evaluating and improving how school systems serve English learners. As detailed in our companion report, Seeing Clearly: Five Lenses to Bring English Learner Data into Focus, parsing EL data metrics and drawing valid insights from them is inherently complex work. Oregon provides an illustration of what it can look like to apply key principles related to EL data to concrete policy reforms.